Guidelines for a Harmonious Home. Domestic Diva Depression (care of MM Playmo productions). Ok, kids, let’s get this straight. Since I became a mother I have discovered a side to me I had never imagined in my wildest dreams. The amazing ability to give you the piece of chocolate I got with my coffee. A capacity to wake up, get up and clear up your vomit at 3 am and even soothe you back to sleep afterwards. The willpower to drive 60 km back to the zoo to rescue your favourite toy from a night with the monkeys. I have covered for you when you’ve cheated on eating your veggies. I’ve even run for you, something I usually only reserve as a solution for urgent predicaments like being chased by a three-headed monster. But today, when I walked into your bedrooms, something happened. Somehow, that blind instinct to clear up behind you backfired then disappeared in a puff of smoke, leaving me wondering why, oh why, I’ve been so downright passive for so long. Any burglar breaking into our house would take one look, presume that someone got there before him, and leave. Being a cool kind of mum, I’ve thought this over and have drawn up a short list of helpful comments for your future assignment: clearing up after yourselves. In this house, clothing mysteriously takes over each and every room. Orphaned socks sob inconsolably in baskets, prowl dangerously under the beds and scream to be released from the depths of hastily deserted, concertina-ed trouser legs. Forgotten pullovers drape casually over armchairs, shoes pile up at the door like a modern-day mecca. You know what? Contrary to common belief, clothing is incapable of clearing itself away. 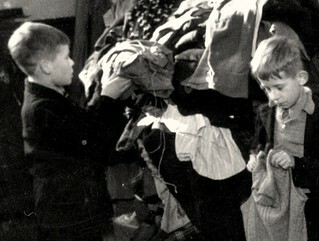 The underwear, shirts, jeans and pullovers that you leave on your bedroom floor will not miraculously drag themselves through the door like Private Ryan, crawl down the corridor and clamber, exhausted, into the laundry basket for salvation…. however long you wait. I was curious enough to do the experiment myself: after leaving the clothing on your respective floors for an entire week, the only direct result to be reported was a mini-Kilimanjaro in each bedroom, and three children who stoically mountaineered though the debris to their beds but strangely had nothing left to wear. I would also like to stress the importance of picking up the piles of carefully folded clothing on the bottom stair, and taking them upstairs to the relevant rooms. Yes, another scientifically designed “Mum test” has proved that in the case of clothing piles being neatly and equally distributed over the width of two consecutive steps, the average family member somehow still manages to step over them and climb the stairs empty-handed (the alternative theory being that folded laundry is merely visible to the person who folded it, dexterously dematerializing on the arrival of any other human being, but this is much more difficult to prove). Please bear in mind that any clean, folded clothing found abandoned on the bedroom floor as a last-ditch attempt to get back to previous more “enlightening” activities such as TV or texting to (officially ex-) girlfriends will result in a maternal desire to burn the aforementioned articles and innocently claim that they have been eaten by the washing machine. 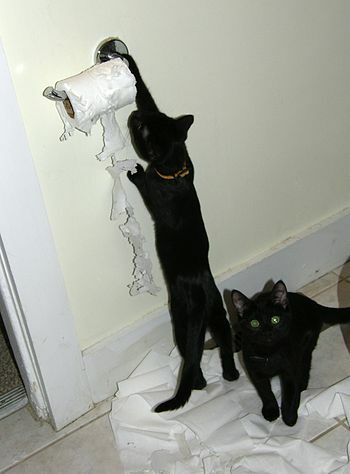 Unlike the universe, a roll of toilet paper cannot be argued to be infinite, and it is really not cool at all to finish the roll and leave the cardboard tube for the next person. FORWARD PLANNING, guys…. Think about it. It’s either that, or you get woken up by a snarling genitor screaming for loo roll at 6.30 am. And now, a special request to male members of the family (sorry, I couldn’t resist that one…): As we so nicely say in England, “If you sprinkle when you tinkle, be a sweetie: wipe the seatie”. Strangely enough, we girls don’t miss the target, yet we’re the ones who get to clear up after you guys, who seem to confuse part of your anatomy with a pressure hose. It would also be an added bonus to female members of the family if you could put the seat back down and flush: Innocent mothers who go to the loo in the dark to avoid waking the entire house generally jar their backs falling the extra unexpected centimetre and scream when they hit cold porcelain with their pyjama-warmed behinds. a) If you know how to get things out of a fridge or a cupboard, then you know how to put them back. b) Here’s a bit of Kitchen Pythagoras: The distance from the table to the sink is equal to the distance between the table and the dishwasher. Just to remind you: take a straight line south from the tap, then follow through left to the dishwasher door, which opens and gratefully accepts all donations. Please realise that if there had ever been a gas leak in the dishwasher, I would have died years ago given the amount of time I spend with my head stuck inside it. c) Note about reactions on seeing full cupboards and fridge. All our electrical equipment has been thoroughly house trained, so please feel free to create a lasting relationship with any member of our menagerie. Take the vacuum cleaner for a walk through your bedroom; he will be delighted to discover the unknown territory underneath your beds, and will happily eat the monsters lurking there so that they don’t devour you as you sleep. 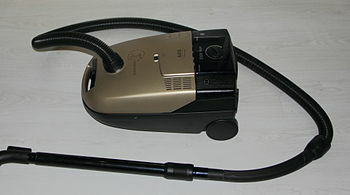 A vacuum cleaner is a bit like a man; you can easily turn him both on and off, and all you have to do is fill his stomach to hear him purr with pleasure. Likewise, the tumble drier does not bite, and when she politely requires assistance by beeping gently, a gentle push on her door will suffice to remove the contents of her tum, hence relieving her of the laundry equivalent of constipation and filling your drawers with clean, fragrant clothing. It’s a win-win situation. This entry was posted in Family, Kids & Collateral damage. and tagged children, Domestic organisation, family, Home, humour, Life, Miscellaneous., motherhood, parenting by Multifarious meanderings. Bookmark the permalink. I have serious doubts that it will. I just saw Bigfoot wander past in his underwear looking for a towel. All the towels have been piled up in the entrance hall as a hint for the last two days, but nobody appears to have understood yet. Oh MM, I’m wiping tears away at this; you’ve made my stomach hurt! I would love to write a piece on Geeg’s room but I fear her wrath more than I covet the readership! She has a wonderful recycling habit…a pile of clean clothes lands neatly in her bedroom, they remain there for two to three days and then she redeposits them in the laundry basket to save herself the time and effort of having to put them away. The last time I caught her doing it, I threatened to send them all to charity. I would love nothing better than to photography her cesspit *ahem* I mean bedroom for evidence but I’m too scared of the possible repercussions, her being possessed by an hormonal demon, and all. I also once did a little experiment with Oscar’s dad in regards to how long it would take to change a toilet roll…24 empty rolls littered the bathroom floor before I couldn’t bear it any longer and had to clear them away myself. I understand what you mean. I avoid doing things like that too as the effect on the kids would be monumental. Don’t wobble or totter or give up. Keep those rules in place and keep their toes on the line. We’re rooting for you! I have been trying to keep them in place since the kids were small, but strangely enough it just doesn’t seem to sink in. Practice will maybe make perfect. Living with a man who can reduce a pile of clean clothes to painting rags in minutes you have my sympathy – but I’d never have your patience! Loo doors locked at night (you have a key)….long drop bog fixed up at end of garden. No torch. You may have to be prepared for complaints from various schools when their subsequent bruises and burns are displayed thanks to their entire lack of clothes to wear to said various schools…..but your French is well up to it. I get the painting rag phenomenon too – PF has the knack of “just dbbing a bit of paint on this” whilst wearing one of the rare presentable pieces of clothing he owns. Send them for rehab on the secu….. This sounds so, so familiar. Been there, done that, and they learn to live with the mess! I seem to be the only one is the house who is bothered by it all. My husband may say something (if he’s feeling REALLY brave) but he wont pick anything up. Yeah I know, I should whip them all into ship shape! But somehow, that seems harder than just doing it myself lol! The fact they can live with it is just incredible. PF waves his arms around and shouts and gets things done over the weekend, and the children listen. In comparison, my talking/whining/shouting seems to have as much effect on them as cleaning a rhino with a toothbrush. Sigh. Had to smile at your modern day shoe mecca…we have one of those too ! And we have a stairpost which inevitably gets mistaken for the wardrobe – if I leave everything long enough our hall could easily be mistaken for an Oxfam shop. So, you are not alone…maybe I’ll come & join you in the vegetable tray!! 🙂 I have a very amusing vision of all us blogging mothers with messy offspring huddling up among the peppers & onions & getting tipsy on bottles of pink wine…if only I could draw!!!! Thanks again for a good giggle!! Ahhhh, this made me a bit nostalgic ..I harped on every subject aforementioned and more. I made pinning the socks together mandatory ( at the top of my lungs) and I discovered sometimes they still do it in their own abodes. I miss those days and now the house is neat all the time and ….empty. Kids are universally the same and all you can hope is that you wear off on them just a bit. I was thinking about you last week whenI re-stowed the Christmas spirit, bashed my head on the eves and spied the ENTIRE Play Mobil Circus including bleachers and feathers on the bridals of the horses. Those were good days even though I cursed the mess back then ! Now I miss it. It takes time especially for the male species. HAHAHAAAHAHHAHAHAAHHAHAHAH<>>HAHHAAAAAA my laugh of the evening ! I’m printing two copies of this as we speak, folding them up and placing a copy into today’s lunch boxes! I was running behind schedule one morning last week (shocking!) and I asked my 11 year old daughter to please put her breakfast plate in the dishwasher. I came back into the kitchen to see that she had done just that. Her knife and fork were still on the table…………..
Been there, seen that, got the T-shirt 🙂 “What’s the big deal? I did what you asked me to do”. Sigh. This is so damn good… it could become required reading at all schools throughout the world… maybe even showing a man or two might just awake a few memories,,,, and I’m a man !!!!! I’m there in the veg tray with you – can you see me waving from behind the lettuce?? I’m hiding behind the sprouts 🙂 I’ve started on the washing machine training, and funnily enough the youngest has twigged better than her big brothers. She even folds it and puts it away now. I do like the idea of forcing them to wear the stuff they don’t like – the ugly t-shirt they were given for Christmas or the jeans that make their bums look too big. Good thinking, Einstein. Putting the clean stuff away is the next step…My eldest must have been taking tips from Farmer Farthing’s daughter, as I’m sure the clean stuff gets muddled up with the dirty stuff and it all ends up back in the machine. Sometimes I remove freshly washed socks from the machine, still folded neatly in their pairs! Me too – Rugby boy is the worst of my lot for that particular “sin”. Brilliant, MM. And from the comments of recognition, it is obvious that you are not alone. I can certainly empathise, but I am a tad messy too, so I only shout occasionally when things get too bad even for me (and that’s saying something). My youngest is by far the messiest and can render a clean tidy bedroom into a tip in 2 minutes. What amazes me is that the boys have some friends whose mothers actually manage to get them to have immaculate bedrooms all the time. Me, I don’t have the energy or the inclination to maintain a state of war about tidiness. Pick your battles, I say. There is much passive aggressiveness involved too. You ask them to do something, they say ‘yes’ but then don’t do it. You ask again, they say ‘yes’ and still don’t do it. My words go in one ear and out the other without leaving a trace except a brief reply from the automatic ‘yes’ response mechanism. Our kids should have a competition – mine are specialists of reducing the kitchen to a hard hat area in the space of ten minutes after school. I agree with the “passive aggressiveness” you describe – mine say yes, then don’t do it and I end up just doing it myself and steaming at the ears when could have just done it anyway without wasting energy on getting angry. The tidy kids you mention must suffer from Wondeure Woomane syndrome – their mum is no doubt on the local PTA and has already organized the contents of their brains into organic, environmentally-friendly compartments. Brrr. My ex-mil used to tell me how tidy her son was. Once he left home, however, he became Captain Untidy-Piles-on-the-Floor, and she thought it was my fault! He was just reverting to his natural state, and revelling in it! I read “Captain underpants” there, then realized that it wasn’t that at all 😀 You must be some girl if you sparked of the coming out of a closet non-closet user! Where exactly do you sleep in my house, because it is very clear we share the same space. I haven’t had a freak out for a while but I do feel one brewing. I see in the distance a red mist descending! How come I don’t know you and yet I feel the article was personally directed at me….well apart from the allegations pertaining to sanitation or lack thereof? Excellent stuff and always useful when you come to mitigating before a Court. Have written the male view of all this which of course has been empirically proven to be correct. 😀 Don’t your grandchildren wreck the joint for you from time to time, just for nostalgia’s sake? our kids were exactly the same – but now the tables are turned ! Hmm. Number 2 son is tidy. What about number one? your silence is telling 😀 I have heaps of clothing in my room too at the moment – PF’s away for a while and I can’t keep up ! Brilliant list! Perfectly reasonable requests and if posting a list of requirements doesn’t work, I think you should completely go on strike! Brilliant piece. It appears that all children – no matter where they are from – all share the same lamentable behaviour. I would like to add another to your list of woes …. empty boxes / cartons returned to the cupboard / fridge. Son #2 drove me INSANE with that one. I forgot that one! The phantom yoghurt community 🙂 Particularly unfair when our poor darlings are hoist by their own petard – but what else do they expect when they eat two yoghurts with every meal? My son just leaves empty yoghurt pots around the room. Can’t be bothered to put them in the bin until nagged. There seems to be a Biblical law about it: Thou wilt not cast thine yoghurt pot into the abyss until the wrath of thine parent is upon thee. Excellent, and so true!! I am still looking for the answer to all of the above! Another problem I have is the recycling stuff. They know what needs to be recycled, watch me do it, see where I put it, but STILL the empty carton, bottle, envelope goes either in the bin (not the recycling one) or – most likely outcome – beside the sink where the recycling fairy magically removed it and puts it in the correct bin! Grrrrr. Oh, bins; Don’t get me started on that one. When our recycling bin gets full, they just pile it on top of the lid until it falls off. I’ve also tested the kitchen waste bin – they just keep piling it on top but don’t empty the thing. Sigh. Oh yes, the kitchen bin fills, and fills and fills until, of course, I can’t stand it any more and empty it! The recycling fairy arrives at the 11th hour and looks suspiciously similar to me. 😉 I am quite cross with her every time she relents and moves the stuff! Uhu. Just don’t become a Febreze fairy, or we’ll have to send in the blogging gang to save you. The next step is becoming a wondeure woomane, and you don’t want to do that. Aaarrggh, nooooo! Not the Febreze Fairy!!! I was completely with you and thought your suggestions well thought out and reasonable until I got to the vacuum cleaner. Now really MM, you’re expecting a rent-free tenant, I mean child, to vacuum? Under their bed as well? I’ve never known it to happen. Keep drinking the wine. You’ll get over your disappointment. I’ll pop back to Florida and find a friendly gator for you. You keep drinking that wine. Everything will be fine. Hello MM. How I have missed you! Great post! Listen – can you hear the bells ringing? You rang so many with this post. When training The Boy in the art of tidiness I used to put all the items left hanging around on his pillow. This once included an empty tuna tin and a pot of jam. Was that a little wicked? I also find the male species tend to look for things with their eyes closed and only at eye level. They have this dreadful medical condition that will not allow them to bend down to look on lower shelves. Their memory span is that of a gnat; when they finally find what they are looking for they never remember where it belongs to put it back again. How many times have I heard ‘Where are the towels?’ I reply ‘The same place they’ve been for the last 11 years’. I am forever being accused of moving things. Yes, it’s true, I do occasionally move things for convenience but I always inform them of the new resting place. It all falls on deaf ears. I LOVE the idea of putting it all on their pillow. How did he get a tuna tin in his room? I put stuff on the boys’ beds, and they sling it on the floor then back into the wash. I agree for men too – our Silverback always finds the car keys where I put them (i.e. in their allocated place), but them in his coat pocket and buggers off to work with them the following day. Sigh. I’m fine thanks. Back in UK. Sadly LGB’s brother has cancer so here to help out during chemo. Hopefully caught in time. The tuna tin and jam was left out in the kitchen!! I took them to the pillow!! Wicked woman! Off to download your last post to word. No internet at Dad’s either. French technique: “oh, you don’t wanna pick it up? Alrighty then, I’ll do it”. Then you pick up the “objet de discorde” and throw it in the bin. I’m not afraid of loading the car trunk either. It’s “only” stuff. Those damn clothes! Toys were the same – I needed crampons to get over them. The worst toys are the lego blocks. They lie in wait for bare feet at night. A friend once gave her daughter a lesson that was long remembered by finally losing her temper and throwing all the clothes on the bedroom floor out of the window into the garden. She was probably inspired by the time my doughty mother-in-law threw teenaged DH’s beloved air-rifle out of his bedroom window in retaliation for the wanton damage he’d done to his desk with his penknife. Extreme circumstances call for extreme measures, MM. PF is wont to throwing stuff on the floor if it’s not tidied up on occasions, but I’m too soft on them for my own good, I guess.